While student are playing, you can see how they are progressing without looking over their shoulder. (1) Notice, we have automatically selected ALL your students. 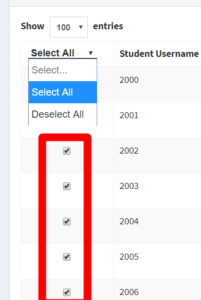 On your Dashboard you can see a check mark to the left of every student in your list. See the red box around the check marks? This will enable you to look at all of them for monitoring. If you do NOT want to review everyone’s progress you can un-check those you do not want to see. Hint: If you don’t want to un-check a lot of students, you can “Deselect” them all at once. In the upper left of the list, see Select All … and then a tiny arrow pointing down? When you click on the arrow you will get a pop-up menu. 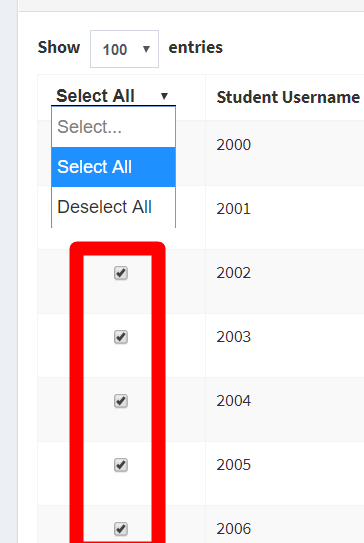 You can choose to “Deselect All” (see it under “Select All” in blue?) and it will take away the check mark by every student’s name, so you don’t have to. And of course, you can choose “Select All” if you want them all checked again. (2) Go to the orange Actions button. With the students selected, find the orange Actions button (above the names) and pull down for a short menu to (3) choose among Review Progress, Export Progress, or Export Learning Track Summary explained on this page. Once you have clicked on Review Progress, then after a second, you’ll see this Progress Review screen. Login The date they last logged in (you can tell if they played recently). # of Start Overs. When a student has one error correction in Take-Off, or three error corrections in Orbit or Universe, they have to do that part over again, before they can pass it. This is how the game gives the student extra practice on items where they need it. Everybody has some Start Overs and some need more practice than others, so they get more Start Overs. Difficulty score. Students with scores below 1 are finding this pretty easy (they average less than one Start Over every part). Student scores over 3 are having a harder time. Watch them play to see if they have some bad habits you can help them correct. If they are passing eventually they are learning, but they are going to need more encouragement to get there, because it is a lot harder for them. Logins in the last 2 weeks. 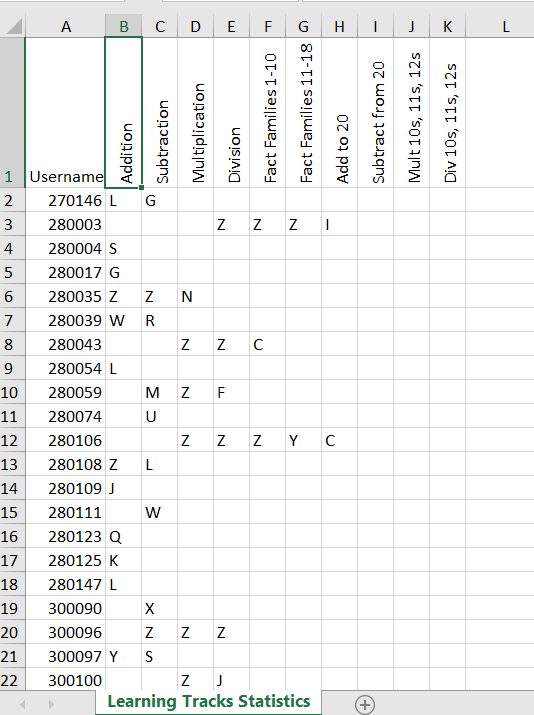 This section shows a mini calendar of the last two weeks with a letter for every day: S M T W T F S. Every day that this student logged in there will be a number instead of a letter. If the student logged in only at school, there will be a “1” showing. You can see the numbers underlined in red for the first student. If they logged in at home too, there will be a “2” in that spot. A “3” or a “4” means this student is really going for gold! Total. This is the total of times that student has logged in during the last two weeks. (We just added up the numbers in the calendar for you.) You can use this total to recognize and reward students who are really putting forth a good effort. PP. PP stands for Parts Passed. Remember, there are three parts to each A-Z level, T-Take Off, O-Orbit, U-Universe so a total of 72 parts for each Learning Track. As students finish 3 parts and complete a level it is colored goldenrod in the chart as a graphic display of their progress. PPT. PPT stands for Parts Passed Today. This shows in green. Only one student passed parts today in this picture, but that student passed 5 parts! But then if you look back at the calendar of logins for today, that student had 5 logins today, so the student was really working. Remember that students can only play for five minutes at a time, so passing one or two parts is all you can expect in one login. When you change their learning track, they will, of course, start over at Set A. If you choose the Export Progress (with the students selected) a file will download on your computer, wherever your browser puts downloaded files. This is an excel type file and will open with whatever your computer chooses to open it with. Looks like this one. But then you can share with whomever, or take it home to peruse over with your favorite beverage. Same information as noted above in Review Progress. The third thing you can select in the pull down menu, to monitor progress, is the Learning Track Summary. We are collecting data on student progress in all Learning Tracks they complete. You will know which Learning Tracks each student completed during the year, as well as what level they completed on each Learning Track when they left it.